A czemu swap ma być gorszy niż off? ;). Muszę sie kiedyś na to Fiji wybrać. Ktoś jedzie ze mną? I am more of a stamp collector, but I do like to check out postcards too. 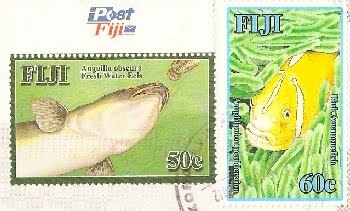 Speaking of Fiji Islands, I checked out stamps on an online stamp catalogue Fiji. I found the yellow one issued on 2006, November 7, and it is named a pink anemonefish (Amphiprion perideraion) . I dunno why it’s colored yellow but its name is pink. The other one was issued on 2008, October 15, and it is a Fresh Water Eel (Anguilla obscura). Copyright © 2010 my travelling postcards All rights reserved.